Equipment Service and Repair Designed With Uptime In Mind. With decades of experience in the industrial pump market space and a robust inventory of OEM parts at our disposal, Anderson Process is uniquely positioned to deliver superior refurbishment and aftermarket services for even the most complex liquid process equipment challenges. 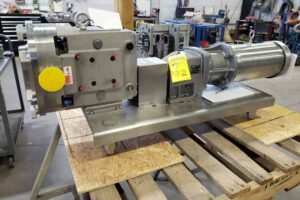 As an authorized service center for many of the industrial process market’s top pump manufacturers, our technicians provide the expert, hands-on service needed to get equipment back on-line quickly and to keep your fluid processing operation running as efficiently as possible for as long as possible. 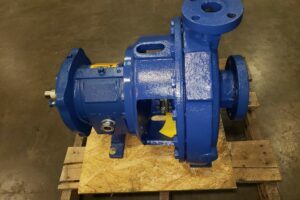 Below are some examples of pump repairs we have done, some of our capabilities include seal repair, rotor and body re-polishing, shaft replacement, bearing replacement, power frame reconditioning and repainting, and more. 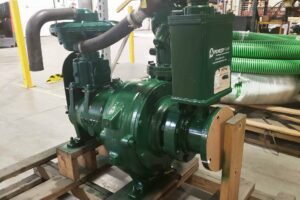 Our repair team just finished rebuilding and aligning an Ampco Pumps Company model ZP1-060-SM to bring it back into service condition. We rebuilt the pump back to its OEM specifications and replaced the gearbox and motor. Griswold 1-1/2×3-13 repaired with a new Flex-A-Seal cartridge seal, replacement bearing frame assembly, shaft sleeve and sealing components. Two Griswold 6×4-13 pump repairs in CD4 construction fitted with new Flex-A-Seal cartridge seals, bearings, seals, shaft sleeves and wet end components to bring it to like new condition. We are an authorized service center for several of our brands. Our repair services keep your equipment running. Our technicians each have a wealth of pump and process equipment experience.